We are urban professionals, educators and researchers from diverse disciplines including architecture, planning, urban design, graphic design, health and medicine. We share common passions. We are at WUF to promote a dialogue about equitable cities, to share our experience in education and practice. We are looking for new synergies, new ideas, new partners, and new ways of learning and doing. 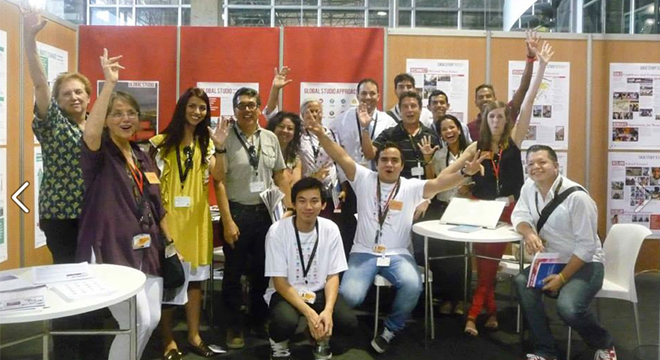 In collaboration with booth partners, the program at WUF7 showcased the People Building Better Cities exhibition with talks, films and discussion. Invited speakers included Anna Rubbo, William Chan, Megan Bullock, Juan Correa, Jose Siri, Geeta Mehta and UPB students. The Habitat Professional Forum was chaired by International Union of Architects (UIA) past president Louise Cox.